Inspired by an old design brief from my time at Tyler School of Art, I created The Village Voice's Sunday magazine—if there was one—as a 2009 side experiment. VOX was meant to be the The Voice's more-mainstream Sunday soapbox for fashion, lifestyle and the arts. The Sunday magazine got it's own mark—recalling the iconic Village Voice with an artful twist. VOX became the Voice's softer, more refined cousin; with a new look and content that focused on NYC-centric creative writing, on-the-rise tastemakers, and current events in the arts. Digital is still an afterthought for most magazines, but the continuing decline of print is an opportunity—to do digital-only and do it well. With that, VOX became The Voice's more refined, digital cousin—the best of New York's up-and-coming fashion, lifestyle, and the arts; and a better reading experience, presented in a way that is more engaging and organicly social. The design is a format that lends itself to becoming a hybrid of the original Voice content and VOX—by adding back some of the grit, politics, and less-mainstream current issues and events... A revitalization for the groundbreaking publication. 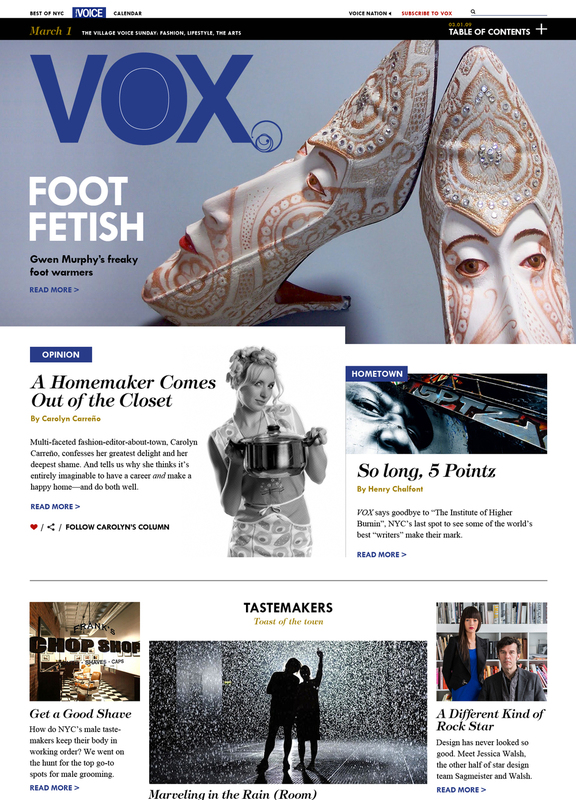 VOX started as the design for a print publication—softer, more glossy and more fashion-conscious than it's older cousin. The publication would be issued as a special, attention-grabbing Sunday-only biweekly edition, in addition to the standard Wednesday issue of The Village Voice. VOX was a side project, but from late 2005 until early 2009 I worked on staff as the Associate Art Director for Dance Spirit magazine—a newsstand magazine targeted at the young dance community, ages 15-18 (think Seventeen for dancers). In this role I directed photo shoots and, alongside the Senior Art Director, designed the monthly magazine from front- to back-of-book, including departments and feature stories. Contact me to find out more about my past work for Dance Spirit.